A key skill for those behind the product range in any shop is to find items that are interesting and different, that will appeal to the customers. If Buyers can find such items, and can negotiate a low price, they will be onto a winner. 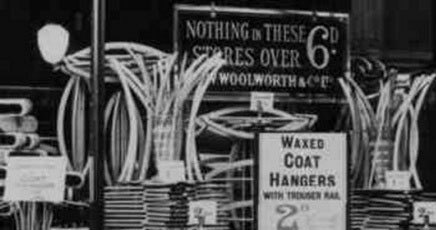 Woolworth's unique selling proposition in the 1930s went beyond its economies of scale and "pile it high, sell it cheap" philosophy. The chain pioneered new materials and embraced new ideas to differentiate its range and create the wow factor in-store. On this page we explore some the innovations of the era. During the Thirties Woolworth's Buyers excelled. They sought new lines and developed an exceptional track record of identifying winners, backed by the courage to place big initial orders. They were also imaginative in designing displays that made even the most mundane item look interesting and exciting. The firm's paper-based 'merchandising system' allowed them to track the sales of "try out" items in selected stores, long before the days of barcodes and EPOS scanning technology. Fast sellers were quickly extended across the chain. Building on the success of the range of their kitchen shop, the firm added everything customers needed for a picnic. Tinned fruit and canned cream became best sellers. Gas fittings were replaced by a new electrical department, which gave away leaflets to explain the new 'clean fuel' to shoppers. The toiletries offer was expanded with a selection of cosmetics in small sizes. These were a hit with budget-conscious girls. Some successes were a surprise, even to the Buyers. They joked that individual feathers 'flew out'. These were sold for threepence each as accessories for hats and gowns. They helped the Balham, South London branch to win the regional window-dressing contest of the popular Daily Express newspaper. 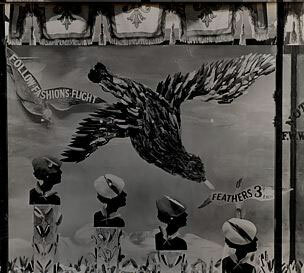 The dresser had painstakingly recreated a bird out of the feathers and had captioned the window 'Follow fashion's flight'. Woolworth was the first firm to spot the potential of a new wonder material in the Thirties that spawned a highly diverse selection of items. Bakelite was an early form of plastic. It could be moulded into any shape when molten and dried to a durable, rock hard finish. Initially the firm ordered a selection of cups and beakers, going on to stock a wide range of electrical plugs, sockets and switches, mainly a dark plain brown colour. But over time suppliers came forward with much more imaginative uses for the new material. Switches and sockets were offered in brighter colours, including a mother of pearl cream and a duck egg blue with a white fleck. A supplier called Otto Rand secured a large order for 'Galbontz' jewellery. He made Bakelite into brightly coloured butterfly brooches as well as ear-rings and pendants. They were cheap to make, looked smart and, despite the sixpenny price ticket, offered a good margin. The signature Bakelite item was the 'VP Twin' camera. This was developed by the Eliot Manufacturing Company, and was initially offered for sixpence (2½p at the time, the equivalent of £2.11 today). Apart from a glass lens and a metal button, it was entirely made from Bakelite. It could take six pictures on a standard film. The rolls were offered for threepence, or for sixpence inclusive of developing and printing. The camera proved to be the best-seller of 1936. As raw material prices rose between 1937 and 1939, the camera was offered in kit form, comprising two and later three sixpenny pieces. Many of the new items were much less glamorous. Good presentation drew attention to the chain's low prices and boosted sales of everyday items like buckets, bowls and coathangers. It seemed that even the dullest line could be transformed into an art-form. Window displays like the ones illustrated could drive a ten- or twenty-fold increase in demand. 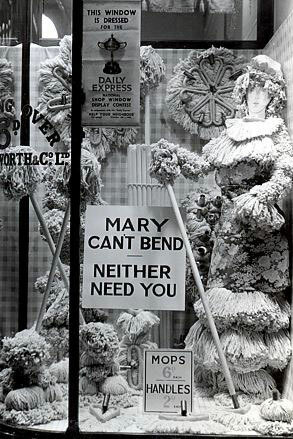 While most window displays were based on instructions from the District Office, Store Managers were given latitude to set up occasional features of their own. The Buyers actively encouraged them to make contact with local factories that supplied the company. This led to a number of mutually-beneficial initiatives in which the manufacturers lent out equipment or raw materials to complement their products in spectacular window displays. These were often pitched to coincide local carnivals and wakes week holidays. A particular favourite, which regularly made the rounds across North West England, was first inspired by staff outings from the Rochdale, Bolton and Preston stores to a local mill. 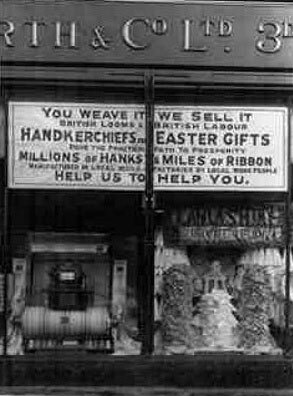 The supplier loaned bales of raw cotton and a large loom to promote their handkerchieves and undergarments. A large sign proclaimed "You weave it, we sell it ... help us to help you". As well as boosting sales, the promotion earnt a lot of goodwill in the community. One late 1930s hit nearly got away. 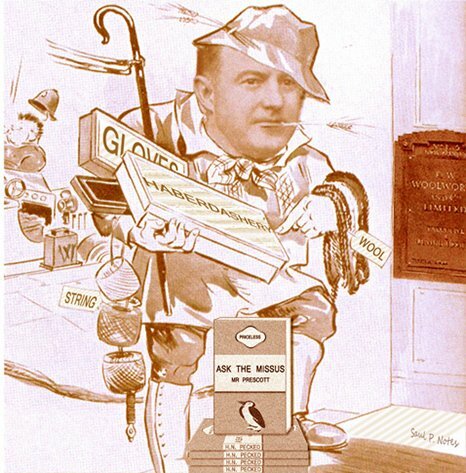 A young man called Allan Lane visited Woolworth's Mayfair headquarters in New Bond Street, hoping for a short meeting with the Fancy Goods Buyer, E. Clifford Prescott. Lane had developed the idea of a 'paperback' book for sixpence. He hoped to persuade the Woolworth man to order his popular 'Penguin', titles. But initially it seemed his pitch was falling on deaf ears, as the Buyer seemed distracted and kept looking at his watch. Suddenly everything changed. Prescott's wife looked in to see if he was ready to take her to lunch. She spotted an Agatha Christie Poirot story among the samples, and mused that if Woolworth's offered soft cover books like that for sixpence, she would surely buy regularly. A few minutes later Lane left smiling, clutching a substantial Woolworth order, which he later described as life-changing. Penguin Books became one of the top-sellers for the next five years and remains a world class brand to this day. Stationery gallery.